The coins will be on view Aug. 16-19 at the American Numismatic Association’s World’s Fair of Money convention in Denver. The double eagles have been secured at U.S. Bullion Depository at Fort Knox, Ky., since the Mint announced their existence in August 2005. Mint officials have said that the coins were so rare that their value could not be calculated. Double eagles were first minted in 1850 with a face value of $20. The 445,500 coins from 1933, designed by sculptor Augustus Saint-Gaudens, were never circulated and the Mint’s inventory was melted into gold bars in 1937 after the country went off the gold standard. A handful are believed to have escaped the melting pot, however, including two that are at the Smithsonian Institution. The Mint has said that the 10 coins going on display in Denver had been taken from the Philadelphia Mint “in an unlawful manner” in the mid-1930s. Joan Langbord found the coins among the possessions of her deceased father, longtime Philadelphia jeweler Israel Switt. Her attorney, Barry H. Berke, has previously said the Mint improperly seized the coins when his client turned them over to the Mint to have them authenticated. A statement dated July 10 on his law firm’s Web site states that Berke “continues to work to have the coins returned to the Langbord family.” Berke did not immediately return a phone message from The Associated Press on Thursday. 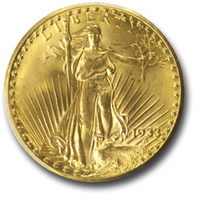 In 2002, a 1933 double eagle was auctioned for $7.5 million, the highest price ever paid for a coin. It surfaced when a coin dealer tried selling it to undercover Secret Service agents. After a legal battle, the dealer was permitted to sell the coin at auction on the condition he split the proceeds with the Mint. Other double eagles seized in the past were melted down.